SPRINGFIELD – Despite legislation passed by both the Illinois House and Senate this week, there is still much to be done to fight sexual harassment in Springfield. 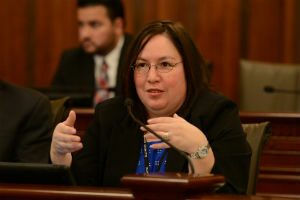 Senator Cristina Castro (D-Elgin), the newest appointed member of the Illinois Legislative Ethics Commission, urged the governor to act quickly today. SPRINGFIELD – Senator Cristina Castro (D-Elgin) isn’t afraid of tackling the big problems our state government is facing. Being one of the newest Senators and recently appointed to the Legislative Ethics Commission, she is hoping to bring fresh ideas break the code of silence that has gone on too long. Senate Bill 402, which passed this week and was co-sponsored by Castro, amends the State Officials and Employees Ethics Act by putting penalties in place for sexual harassment and provide training for sexual harassment prevention. This training will be required annually and the Legislative Ethics Commission will be responsible for sharing the procedure on reporting violations. SPRINGFIELD – The Illinois Senate failed to override a bill co-sponsored by Senator Cristina Castro (D-Elgin) today that would make the Illinois Equal Pay Act stronger. House Bill 2462 would have strengthened the Illinois Equal Pay Act by prohibiting employers from asking about previous salary histories when interviewing job applicants. The measure would reduce the effects of pay discrimination in past jobs. 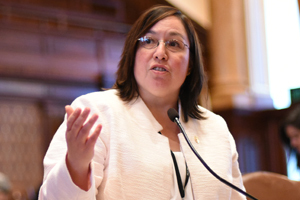 SPRINGFIELD – Senator Cristina Castro (D-Elgin) and the Illinois Senate overrode the governor’s veto of House Bill 3649 to make state debt more transparent and to prevent the pile up of bills being backlogged in our state. House Bill 3649 amends the State Finance Act and requires that state agencies provide a monthly report to the comptroller identifying the current liabilities held by the state agency. This measure will reveal liabilities and potential late interest penalties that may be accumulating. This transparency will help Illinois know what debt is owed by the state. Currently state agencies only have to report once a year, which leads to delayed payments. The consequence of this has led to the backlog of bills our state has and is currently facing. House Bill 3649 was overridden in the House and Senate with bipartisan support.